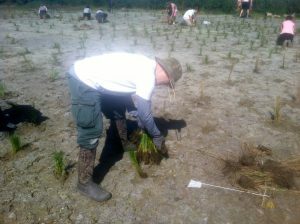 On March 5th-7th 2015, For The Bayou granted $5,000 to the Coalition To Restore Coastal Louisiana (CRCL) and took part in, along with 76 dedicated volunteers, in planting nearly 17,000 plugs of marsh grasses and mangroves trees on a recently filled canal (marsh creation site) in Port Fourchon, Louisiana. 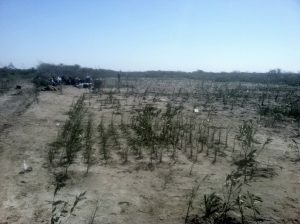 By vegetating this recently filled canal, the marsh grasses and mangroves trees will anchor the soil preventing salt water intrusion and erosion. Port Fouchon Restoration Project 29.129586, -90.220644 On March 5th-7th 2015, For The Bayou granted $5,000 to the Coalition To Restore Coastal Louisiana (CRCL) and took part in, along with 76 dedicated volunteers, in planting nearly 17,000 plugs of marsh grasses and mangroves trees on a recently filled canal (marsh creation site) in Port Fourchon, Louisiana. 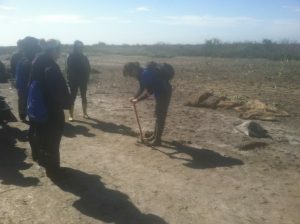 By vegetating this recently filled canal, the marsh grasses and mangroves trees will anchor the soil preventing salt water intrusion and erosion. Read the full report.